Hi Friends! Have you seen the Toxic Framable Digital Design Template on page 25 in the Holiday catalog? You use My Digital Studio to create a framable piece of artwork that matches your home decor. Since we don't have small children at home or any children for that matter I don't go all out decorating, but that doesn't mean that I can't enjoy Halloween. This was the fastest thing to put together and I am by no means a guru when it comes to using My Digital Studio, but if I can do you so can you! I downloaded the template and added it to the My Digital Studio software. Hey remember you can download and try the software free for 30 days. 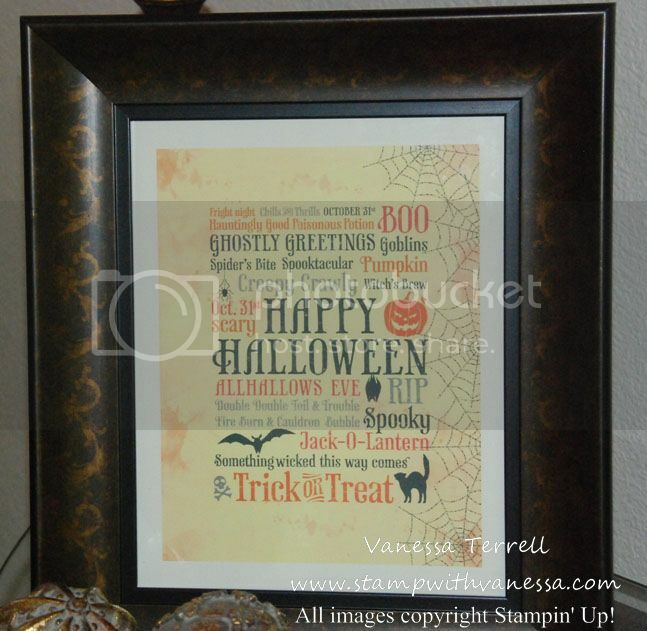 I could have sent my project to have it printed from Stampin' Up!, but since I am so late decorating, I decided to print it at home. I did have to cut down the finished product so that it would fit into my frame. So here is the finished product. It really was an easy project, it took me longer to pick out a frame from one of the big box stores than it did for me to create it! How will you decorate for Halloween?